Who says BBQ has to be bad for you? Stick to your nutrition goals by keeping your recipes light and your plate filled with healthy choices. Nothing says summer like a checked tablecloth and the smell of the grill. Grilling is traditionally seen as a healthy cooking technique; however what you put on the gill really determines the nutritional quality of your meal. Here are some ideas for reducing the calories, but still keeping the flavor at your next BBQ or picnic. What do hot dogs, burgers, ribs, and steak all have in common? They are iconic summer BBQ foods, but also loaded with calories and maybe even worse saturated fat. The great thing about a grill is that it adds rich flavor to food allowing you to choose leaner protein choices. Swapping out a 6-ounce cooked ribeye steak for 6 ounces of skinless chicken thighs will save you 120 calories and 6 grams of saturated fat. Choosing a 4 ounce grilled salmon burger instead of your 4-ounce beef burger (80/20) will save you 50 calories, but more importantly 4 grams of saturated fat. If you are worried about your leaner cuts of meat drying out try an overnight brine; soaking your meat in a salt water solution for 4 to 24 hours. This will help keep the moisture in while grilling; it works especially well with poultry and pork. Finally go heavy on the herbs and spices; they add flavor and create a great crust on your protein. 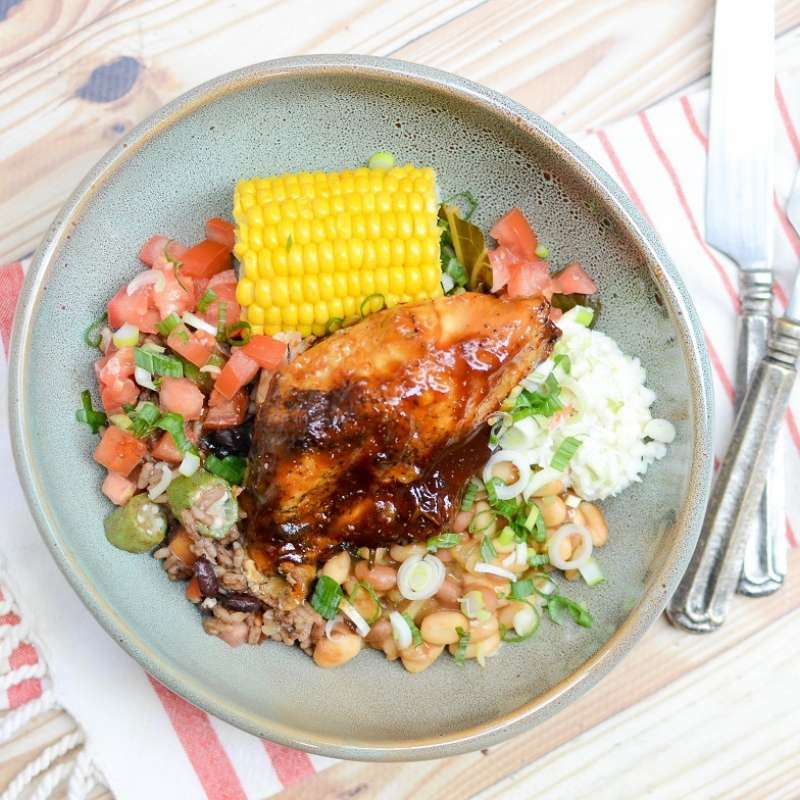 Check out this recipe for Spicy BBQ Chicken Breast. Often the sides at a BBQ can become a meal by themselves. Summer is the perfect time to incorporate fresh local produce into a meal; especially a BBQ. Whether you are hosting or bringing a dish to share almost everywhere in the US has seasonal fresh produce. Instead of a traditional mayo-based side like potato or macaroni salad make a whole grain based salad instead. Farro, wheat berries or quinoa make a great base. Then add raw or sautéed veggies like tomatoes, peppers, onions, or cucumber. Dress your salad with a simple mixture of olive oil, lemon juice and a bit of honey. Now you have a side that is lower in saturated fat and loaded with heart-healthy fiber. You can also add seasonal fruit like peaches, plums or berries to a whole grain salad. Chopped fresh herbs will add color and even more flavor to these dishes. If you are looking for a gluten-free option bean salads are a great alternative; they are filling and are loaded with heart-healthy fiber. Dried beans are a great low sodium choice if you have time to soak and cook them. If not look for lower sodium canned beans and make sure you give all canned items a good rinse before using them. Tossing beans with some diced veggies and a low fat bottled vinaigrette is an inexpensive and time-saving way to go. Try this great recipe for Baked Beans as the perfect accompaniment to your BBQ. No party is complete without a dessert, but this is the time people have the most guilt with their choices. Let even your most health-minded guest enjoy by making fruit the star. Grilled fruit is a tasty ending to any BBQ; pineapple, peaches, and plums hold up to grilling particularly well. Cut stone fruit in half and remove the pit. For pineapple remove the rind and then quarter. You can keep it simple and just spray the fruit with some cooking spray and grill or amp up the flavor with spices like cinnamon or chili. Even if you top the fruit (which you don’t have to because it is great on its own) with a scoop of ice cream you are still saving calories and adding fiber and vitamins to a typically low nutrient part of the meal. Healthier choices don’t have to make up your entire menu, but they do add great balance and will ensure all of your guest leave feeling great. Summer is the perfect time to support local farms and get creative with your food.